The Borno State Emergency Management Agency (SEMA) yesterday said five persons were killed and 30 others injured in a suicide bomb attack in the outskirts of Maiduguri. 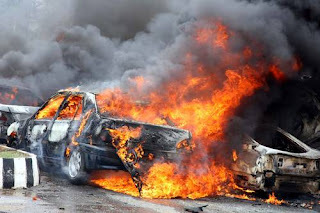 Head of Emergency Response Operations of SEMA Mr. Kachalla Usman confirmed the incident in an interview with the News Agency of Nigeria (NAN) in Maiduguri. He said three persons and two suicide bombers were killed, while 45 others sustained injuries in the blast.